There seems to be more and more Young Adult hockey-themed titles nowadays, and that is in large part thanks to publishing group at Lorimer. They have made the wonderful decision to go into this market, thought of by many as the toughest market of all - boys aged 10-14 or so. The best thing is Lorimer understands the market and that these boys are often reluctant readers. With that in mind Lorimer and author Jacqueline Guest tackled the project Rink Rivals. It is a story, originally released in 2001, of twin brothers from a tiny native community in the far north who relocate to Calgary. Hockey may be the only thing familiar to them in the big city. Soon they learn the temptations of the bright lights and busy streets. Bryn, a musical prodigy, trades piano practice for hockey practice to impress a new girlfriend; Evan, the family hockey hero, starts running with a bad crowd and neglecting the game. As the brothers' lies get them in deeper and deeper trouble with their parents, they have to rely on each other to gain the courage to do what's right. 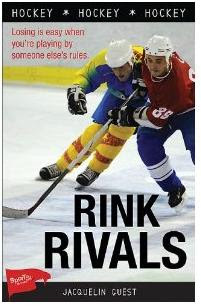 Rink Rivals is an action-packed account of how sport can help young people find the courage to confront sudden and radical changes in their lives.